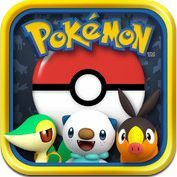 Pokédex for iOS is the counterpart to Pokédex 3D Pro released for Apple devices, iPod Touch, iPad and the iPhone. It contains data on all the Pokémon including moves, stats and showcases them in 3D, much like the 3DS game. This app starts off with just the Unova Pokémon, but allows you to purchase the other Pokémon for 500 yen each. As such, all the search engines are updated with the other Pokémon, allowing for full interactivity to be discovered.